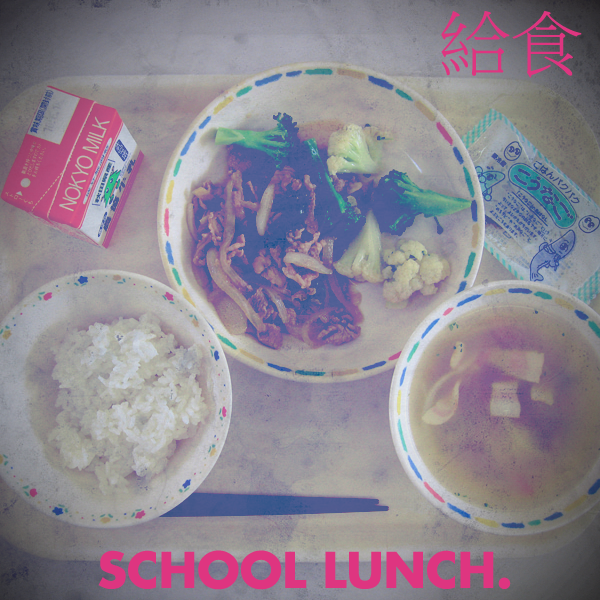 On Eating School Lunch in Japan, Part 1 | This Japanese Life. Posted on April 24, 2013	by E.
Eating lunch at a Junior High School in America was my first confrontation with the absurdity of my situation as a student. It’s an introduction to Lord-of-the-Flies social dynamics. The combination of half-formed brains, hormones, and the task of obtaining food purified the experience into Darwinism at its worst. You developed some form of social strategy to survive, or you were consumed like the mystery meat doled out on our trays by rueful lunch ladies with bodies so ill-formed for such a gleefully malicious environment that one assumed they were secret masochists. We quickly sorted into tribes of strengths or common weaknesses. I don’t need to describe the cliques, it doesn’t matter, none of us escaped without damage. Some of us got by on kindness. I learned to distract from any attention to myself by making jokes, a clumsy process with a lot of false starts and a regretful foray into prop-comedy. Lesser people resorted to withering insults, but I took the high road and stuck with puns, which made me ill-suited for any room younger than 55. The pinnacle of my lunchtime Galapagos experiment was the outbreak of a war between factions of bullies. How it started is irrelevant, but the end result was two 14-year-old toughs circling each other wielding food products like pocket knives. In one hand, a hot dog doused in ketchup, in the other, a vanilla ice cream cone. The two circled each other, alternatively tossing out curse words or taking a stab at the other with the remnants of lunch. Neither was held with any degree of self-awareness, but at that point I, as an observer, was comforted by the sudden and unexpected realization that everything in my life was completely meaningless. This would not happen in Japan, because, for one, there are no cafeterias in public schools – Everyone eats in their homeroom. But there’s a larger, more coherent strategy behind Japanese public school lunches that begins in elementary school and has become the envy of the world, despite the world’s reluctance to learn anything from it. The first school lunch was served in 1889 as part of the Meiji period’s “Rich Country, Strong Army” ethos for invigorating the country. The government wanted a stronger army, a better workforce and a more educated population to rival the West, and saw nutrition as a crucial cornerstone. Specifically, the first lunch tray was cooked by hot rumors of peasant revolt in Tohoku. When a tsunami hit the region in 1886, farmers struggled to rebuild. By 1889 crops were still devastated, and impoverished farmers were getting desperate. The Emperor shipped rice from surrounding prefectures into the area and offered them to school children. Parents paid out of pocket (they still do, today) but there was actually food for their children to eat. The system was adopted piecemeal across the country, with food donated or sold to schools cheaply by local farms. By the 1920s, this makeshift food distribution network was challenged by military expansionism. When WW2 finally broke out, soldiers got the rice and kids were left with mountain potatoes. School lunch shifted to “calorie security,” if the kids got enough calories the government was satisfied. This was hardly a progressive child-welfare policy: These kids were being fed potatoes while working in weapons factories or farms, replacements in the field for the men sent abroad for Japan’s invasion of anything it could reach with a boat. After 1945, the US occupation’s grandiosely named lunch lady, the “Agricultural Office of the Supreme Commander for the Allied Powers,” imported an American-styled school lunch program, formalizing a balanced approach to nutrition. By 1951, school lunch was universal across Japan: 600-calorie meals, with 25g of protein, centered on bread and milk rather than rice and tea. (The calorie requirement still stands, though ranges upwards by age group to 820). Bread has been touted as something of a miracle food during the war years in America, with the Surgeon General declaring that eating it was a “patriotic duty.” When the war broke out, America was recovering from the Great Depression and potential soldiers were being turned away for malnutrition – 380,000 of the first million volunteers were too weak. By 1943, the government mandated bakers to add a vitamin mixture to flour in all industrial bread, fattening up Americans for war (and seemingly never turning back). [For a fascinating history of American white bread – yes, I just wrote that – see this article from The Believer]. Japan’s agriculture was devastated by the war. Rice was hard to grow in 1945 and harder to distribute. But Americans had plenty of experience baking enriched white bread quickly, and there was plenty of extra wheat from home. Occupation planners saw the switch from rice to bread as a defense for the emaciated and malnourished Japan against the seductive lure of Communism’s centralized agricultural planning. Then there was milk. Japanese cuisine never featured milk, and Japanese people are typically lactose intolerant. But armed with anti-Communist nutritional motives, the occupation forces saw fit that milk was distributed to every growing child in the country, going so far as to make milk drinking mandatory for the post-war tweens. Milk was cheap, fatty, vitamin-dense, and easily distributed (especially in its chalky powdered form). Kids hated it. Few of these kids had seen milk before, and the powdery, chalky white liquid was consumed as a chore, less delicious creamy beverage and more dusty, watery medical supplement that gave them diarrhea. One JHS student from the era remembers that “The bullied kids were forced to drink five or six cartons in a row.” Teachers resorted to ordering kids to drink the stuff, which spawned a still-unofficially maintained (and frequently mistaken for official) policy of teachers demanding students finish entire meals without any waste. By 1978, Japan was clearly surging forward, and anxious about losing its traditions. A slogan emerged: “Japan is a land of rice, and Japanese people eat rice.” This sentiment hastened the end of government-mandated white bread: The fortified, enriched staple had slowly declined into its current state of nutrient-free mayonnaise sponge. The government was also trying to fill a social demand to strengthen Japanese food culture. With calls to return to tradition balanced by nearly every tradition carrying the stigma of hypernationalism, food seemed a safe, politically correct choice. To that end, when rice came back, it came back with a curriculum. Read Part Two: Everything I Learned About Life, I Learned From Lunch Committee. If you like dusty, watery medical supplements, you might like “This Japanese Life” on Facebook. This entry was posted in Food, Teaching. Bookmark the permalink. Your description of the school cafeteria made me laugh out loud. I’m a semi-retired teacher who taught in elementary through high school levels. Elementary kids usually march in and sit as a class. However, in junior high cafeteria life becomes more treacherous. I actually had popular high school seniors who were afraid to walk into the cafeteria on the first day of their last semester at school! Why? They didn’t know who would be scheduled at the some lunch bell and didn’t know where to sit. This seemed ludicrous, but human if not humane, to me. Actually, some schools in Japan do have cafeterias. Japanese public schools might not, but private schools do. I worked in a couple. Thanks for clarifying! I’ll make an edit to correct it.